Since my lovely little girl arrived 3 months ago I now have a reason to check out girly little clothes at every opportunity. On thing that continues to amaze me is how pricey those cute little dresses are. I recently saw a plain fleece jumper at a major chain that was $20. I know some people wouldn't call that pricey, but for the basic design & fabric that could be made for A LOT less and with a lot more personality in about the same amount of time it takes to drag out to the store & buy one. So I created my own jumper dress pattern and made it reversible. The basic shape means it is very easy to make - just a front & back piece of each fabric, stitched at the sides and then stitched together around the top edges and then bottom. Super fast for even the beginner sewer - I didn't even need to top stitch around the top. Using snaps at the straps makes it look good from both sides. 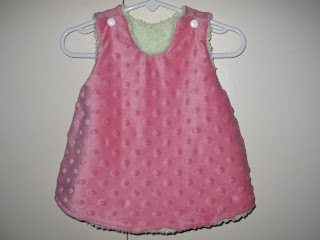 The other bonus is it uses very little fabric - my 3-6mos size used less than a 1/4yd for each fabric, so I used scraps leftover from other projects for my fuzzy mint/pink minky dress. 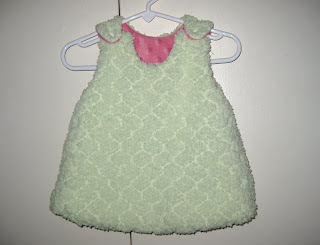 The other bonus is because it's reversible, besides having two looks in one, just about any fabric can be used. So those gorgeous cotton prints that are too thin for winter can be paired with a thicker fabric & create limitless options. Just pair with a long sleeved shirt & tights/pants for winter and can be worn by itself in summer. The pony print was a fun bamboo terry and the reverse is a solid tan knit. On future versions, I plan to add pockets, appliques, embellishments...the possibilities are endless and even the fanciest version is still going to be a steal compared to the store stuff. Can't wait until after the holidays when there's time to let the imagination run wild! I'm linking this post with the Penny Pinching Party over at The Thrifty Home. Head over to join in with the fun! Cute! and the model is precious! I think she looks like Declan? Those little kissable cheeks! Okay, that's weird. Our babies look very alike...and my son turns 3 months on Monday. No kidding. Thanks for linking up to my party. 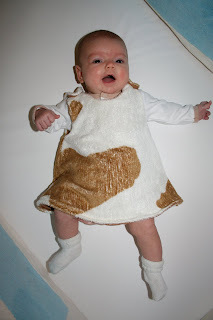 I love all of your projects and am amazed that you can do them with a newborn.